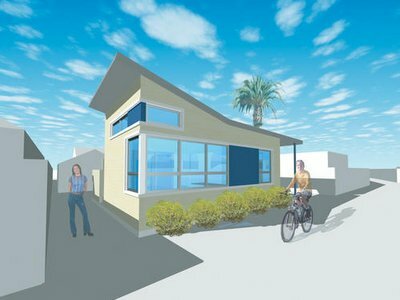 If you've ever considered converting a detached garage into a cozy little homestead – well, so has the local housing board of Santa Cruz, California. 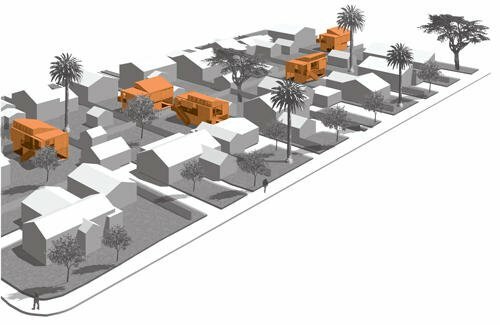 Santa Cruz, according to Metropolis, is hoping to combat urban sprawl through the use of so-called Accessory Dwelling Units (ADUs) – otherwise known as garages. By rezoning detached garages into dwelling units, and then offering small loans for the construction and/or renovation of these tiny houses – "granny flats," they're also called – the city hopes to take advantage of its own unused margins and backlots. Converted garages, they say, are "a low-cost way to accommodate surging population growth without increasing sprawl." 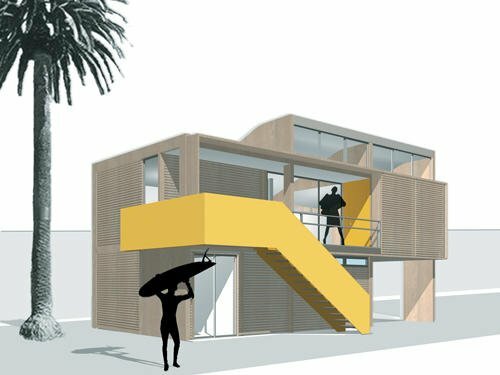 To help it work, the city commissioned seven prototype designs, small units that are easy to assemble – pre-fabricated garage-homes, basically – and a few of them even look quite cool. 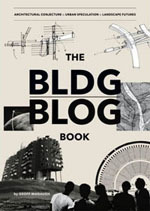 It's an awesome idea, I think; it even won Santa Cruz an AIA urban planning award (see this PDF). With any luck, such ideas will spread and be picked up elsewhere. Having said all that, however, the sheer quantity of unused space in American cities is astonishing; the city I (regretfully) live in, for instance, is only one of the most obvious examples. But the fact that the use-value – let alone exchange-value – of American urban space does not price certain structures out of the architectural market completely (single-story car parks, for instance) amazes as much as it annoys. 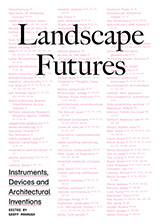 As only one quick – but suggestive – example, you could buy a plot or two of mid-priced abandoned land and rapidly construct your own mini-village of pre-fab garage-conversions – with a personal work building, a sleeping/reading/chill-out building, a kitchen/eating/family building; you could even link the individual structures with roofed walkways or elevated terraces, and they could have roof gardens, and guests could sleep in their own cabins... and yet all of that would still be your everyday home – and it would cost less than constructing a standard bungalow. 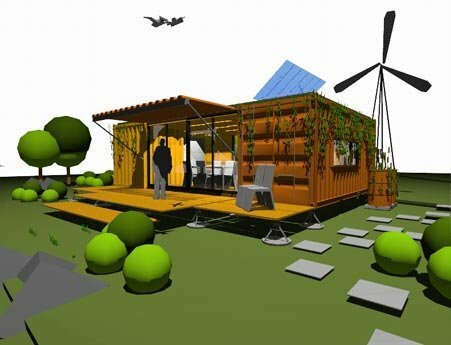 [Image: The Pad Home, from Pad Life (also at Inhabitat)]. 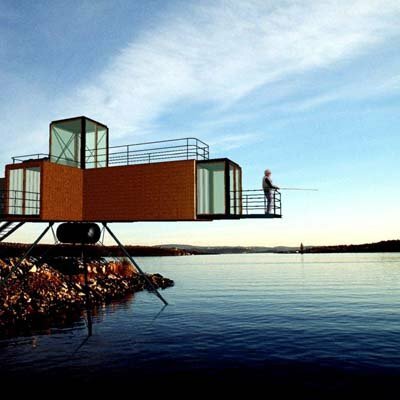 [Images: HyBrid's Detached Studio, 4 over 2, and Base Camp, part of their Cargotecture series]. [Image: A page from the Ten Year Hotel project, by Lee Ferguson and Jonathan Whittaker, in which shipping containers are suspended in a grid of steel beams, then laced together with interconnected walkways]. [Image: The fhiltex project by MMW]. 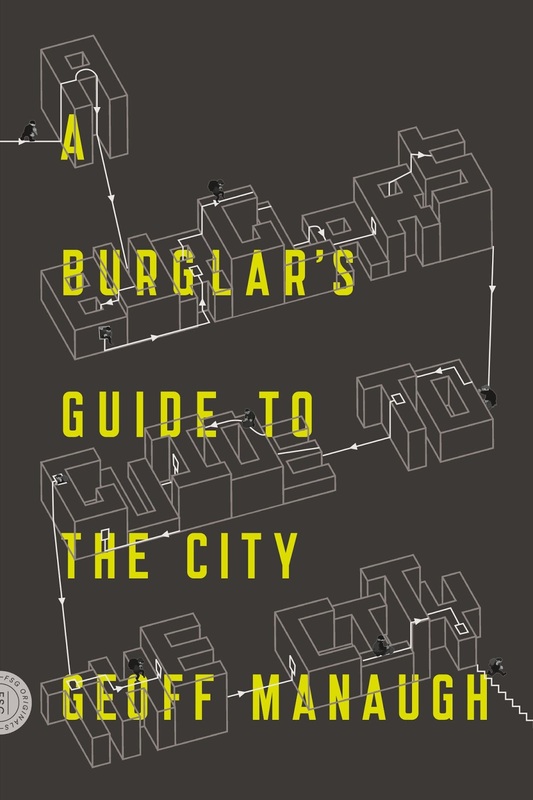 – and then you're talking about entire, modular micro-cities, spanning property lines, self-connected through walkways and terraces, with pedestrian paths leading around the bases of small towers, and one city block could house more people and be more fun to live in, and its intricate spatial possibilities would rival Piranesi. 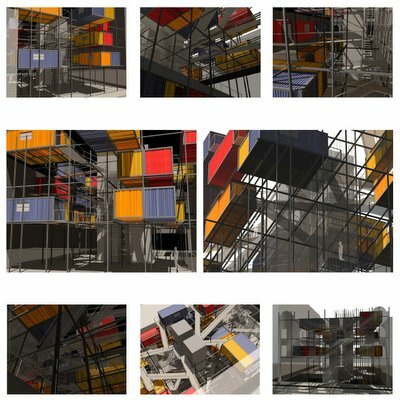 Young architectural firms and design start-ups could draft the modules... BLDGBLOG could then be written and produced from inside a small tower made of insulated shipping containers, with skylights and wrap-around porches, even a moon-viewing platform – but I've digressed into public daydreaming. 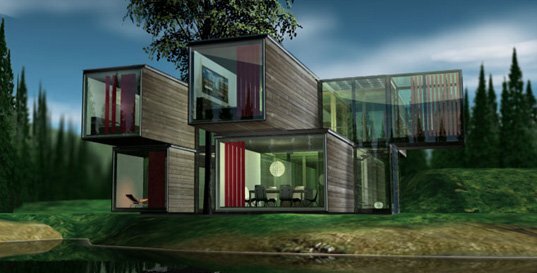 For more info, possibilties, examples, etc., check out the impressive and thorough list of pre-fab structures at the always excellent Inhabitat, as well as a few cool links through Container Bay, and there are even more options and varieties at the Living Box page of edilportale.com. (That last link comes via Architechnophilia). Even better, if you're a millionaire urban developer and you like the sound of these ideas... let's talk. 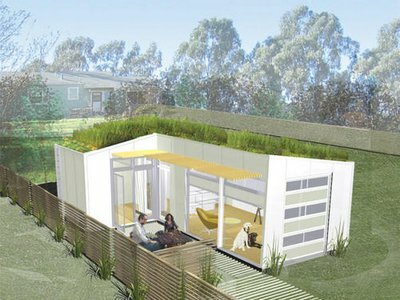 If the container houses are Cadillacs from the '60s, then these little cubes are definitely Smart cars (in fact, the picture on the site shows a Smart car parked in front of a "micro-house," to reinforce the tininess.) 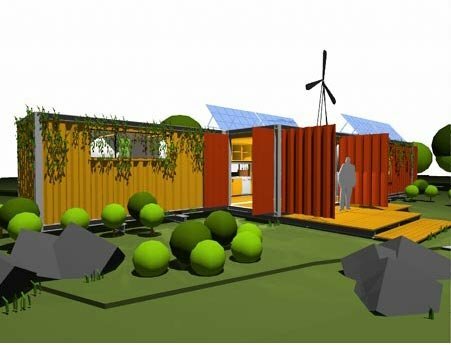 Apparently a "small village" of these 9ft by 9ft by 9ft houses is being set up on the campus of Munich University, which has already tried and rejected the sea container solution. 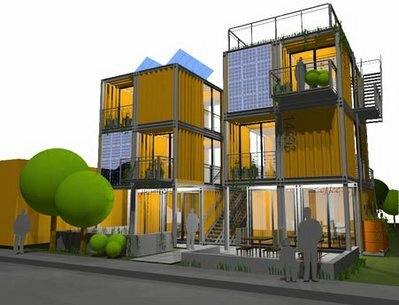 Although these pods are not envisaged as long-term housing, they have a lot of attractions: they can be carried on the back of a truck, they can be stacked, or "laid out in small colonies", and "the seats are also storage cupboards and can be cleared away to create a space in which three or four people can dance to the inbuilt surround sound system." But, and it's a big but, the entrance lobby has to double as your shower and your toilet ...!